The original Kid Tripp ($0.99) was an excellent ode to Westone’s classic Wonder Boy and the Adventure Island series that it spawned. The game looked and sounded like a latter day Master System or Game Gear game, and the auto-running platforming was almost pitch-perfect. 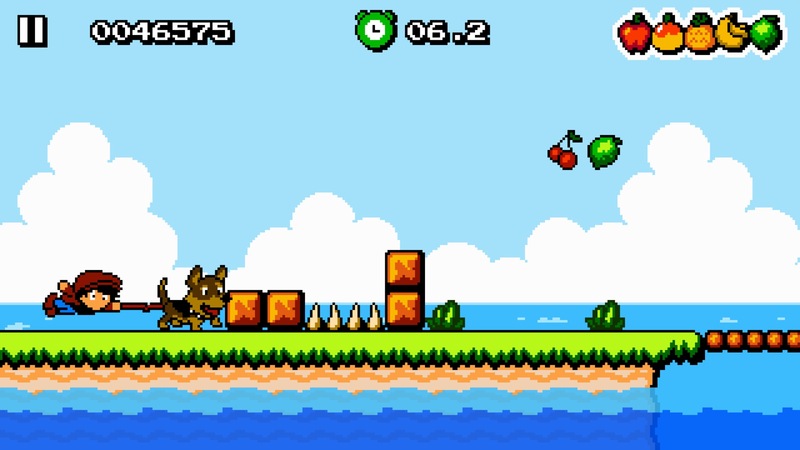 To this day, I consider it one of the better platformers available on iOS. Well, the kid is back, and this time, he brought his dog. More importantly, however, Miles & Kilo ($2.99) tries to advance the Wonder Boy-style gameplay with new moves, gimmicks, and obstacles that Tom-Tom never had to worry about. The result is a fantastic game with one foot planted firmly in the past and the other in the here and now. If you like platformers, you won’t want to miss this one. Miles is like every other young boy. He’s curious, likes to play with his dog, and enjoys flying his personal airplane through dangerous storms. You wouldn’t think anything bad could come from that. Sadly, while navigating one such storm, his plane is brought down on a remote island. Don’t worry, Miles and his pup Kilo are fine, but the plane is in pieces. Although Miles, like any responsible kid, knows how to re-assemble an airplane, some hooligans abscond with the parts before he can get to work. Well, there’s nothing else to be done except to chase those jerks down and get the plane parts back. Miles and Kilo exit stage right after the baddies, and we’re on our way. The game takes place over 5 different worlds with a total of 36 stages. Those stages rarely take more than a half-minute or so if you run them perfectly, but therein lay the trick. They’re packed full of dangers and obstacles, and while it’s certainly possible to clear them on your first try, you would have to have pretty snappy reflexes and a sharp eye. On top of that, simply clearing them is just the start of the battle. There are coins and fruit strewn about each level, and a timer keeps track of how long it takes you to get through the level. Another helpful counter keeps track of how many deaths you suffer. All of these things are taken into account to determine your grade on each stage. Naturally, you’ll want to get an S rank on every stage. In the original game, the kid could run, jump, and throw fruit. Even without taking Kilo into account, Miles has a much wider array of actions at his disposal. He can slide, wall-jump, surf, punch, and more. Good dog Kilo is no passive pup either. He can run, jump, and lunge to bite baddies in a move reminiscent of the godless latter-day Sonic’s homing attack. How does all of this work without complicating the controls? Well, it’s all about the context. To start with, Kilo is only available in certain stages and sections. As for Miles, if he’s near something punchable like a crumbly wall, tapping the right side of the screen will unleash the beast. If he’s near something slide-able, like a low hanging wall with a gap under it, tap that same side to zip under it. See something you can climb? Just jump towards it and he’ll hang on automatically, allowing you to kick off with a jump by tapping the left side of the screen. Well, you get the idea. If there’s nothing context-sensitive around, a tap on the left will jump and a tap on the right will toss a fruit. Unlike in Kid Tripp, you don’t have to worry about lives here. 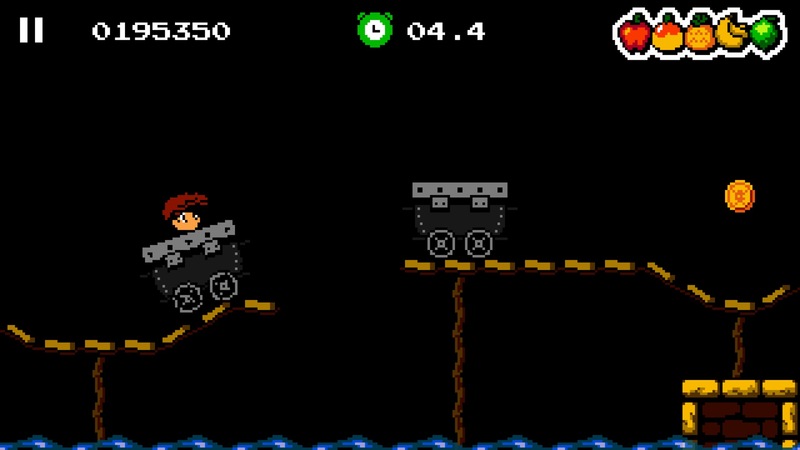 The game will keep its grim counter of how many times you screw up, but you’ll always be set back at the beginning of the level again like nothing happened. But you’ll have your memories, and you’ll need those to make sure you don’t make the same mistake too many times. Since there are no lives to worry about, coins don’t do anything this time except contribute to your score and rank. But they are nice and shiny, so you should probably collect them anyway. In Kid Tripp, you could toss an endless supply of rocks at enemies. You’re a bit more limited in this game. Miles can carry up to five pieces of fruit at a time, and if you waste them, you’ll have to collect more. The fruit stocks in most levels are fairly generous, but it’s something else to keep you hopping, potentially sticking your neck out into trouble. The visuals have gotten quite an overhaul, too. Everything is presented in a higher resolution with more detail and animation than could be found in Kid Tripp. The audio isn’t all that different in terms of quality, which is fine given the era that Miles & Kilo is paying homage to. Chip tunes and sound effects that wouldn’t be out of place during SEGA’s golden years seem like the right choice even as the graphics are reaching a little farther. I also need to mention an interesting feature that I think is undocumented. If you play with an MFi controller, the game goes from being an auto-runner to a regular platformer. It’s easier to get through stages this way, but harder to get a good score, so it’s your call. The game is obviously designed around the auto-running concept, but it’s cool that the developer threw that option in there for those with controllers. The play’s the thing, though, and that’s where Miles & Kilo shines the brightest. The controls are spot on and never get confusing in spite of the relatively large number of actions. The level designs are magnificent, with the new array of abilities allowing the developer to do things that couldn’t be done in the last game. Once you get into the groove, making your way through a level is like following a visual beat. Hitting all the notes, so to speak, feels fantastic, and that’s entirely down to the careful placement of hazards and enemies. I’d also like to commend the developer for putting a slightly gentler difficulty curve in this game. It gets tough, but it’s not nearly as prone to random difficulty spikes as Kid Tripp was. Miles & Kilo is everything you could want from a follow-up to Kid Tripp. I love the sensible improvements it makes to the Wonder Boy formula, and the level designs are spot on. The new moves and additional character help keep things fresh, and the amount of content feels just about right. The game’s rather adorable retro-style presentation is also a winner, lending it the image of a console “big brother" title to the original’s handheld game. 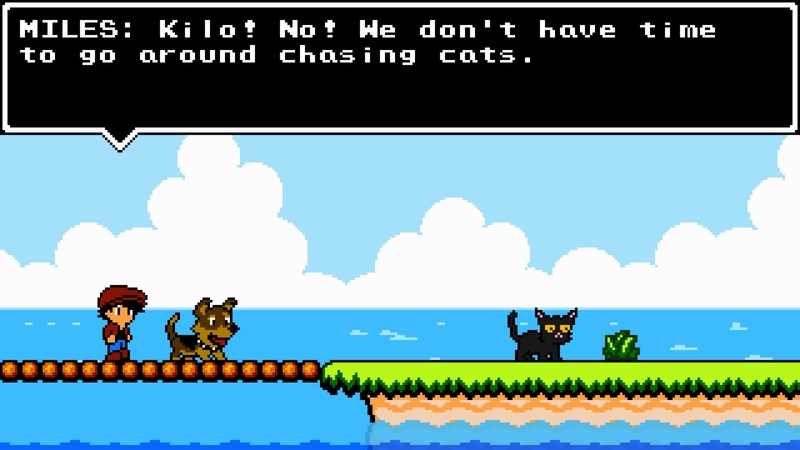 Those who love a good platformer will want to add this one to their collections immediately.